Today would have been my wedding anniversary had I stayed married - 55 Years - but I didn't survive the marriage and left just before the 25 year mark. In this dream, it was winter time and the star of the dream was Jim Carey along with a huge crew of other guys all dressed in airplane pilot repair crew garb over their regular clothing. This dream started out in a building like an airplane hangar but I didn't see any airplanes and the place was full of people and we all needed to survive and it was winter. The weather wasn't howling outside but it was cold nonetheless. I'm used to talking about summer survival with growing one's own bees and gardening. In winter there is none of that going on and that's what we were focusing on - how to stay warm to begin with. Jim always had a smile on his face and there was a lot of hugging going on. I think its good to have a positive attitude, so we'll start there. 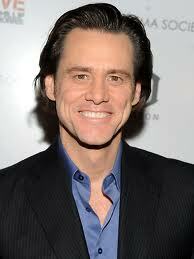 JIM CAREY DECIDED NOT TO DO DUMB AND DUMBER TILL 18 YEARS AFTER THE ORIGINAL FILM. 8-13-12 - DREAM - I was living in a newly built bare boards cabin with very large rooms somewhere. I noticed that there were no frames around the doors, that they were set flat into the boards of the walls. There had to be framework on the buildings though because there were long hallways between rooms. Note: Several of my sons are professional carpenters so they probably built the cabin themselves. Another one of my sons is an electrical engineer but I didn't see him in the dream. 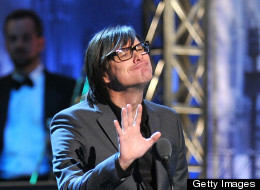 I just assume he was there. The kitchen was very large, I didn't notice a stove, our food was all raw, cut into chunks on a board - such as lettuce, tomatoes, cheddar cheese, and some other vegetables - all raw pieces. We just picked up what we wanted to eat and took it to our bedrooms where we read books without covers so I don't know what they were about. The boys were working on some kind of electrical system that would control the doors at a distance. I told them I had tried that once before and it didn't work, so they were trying it themselves. I saw no windows to the outside so I have no idea where we were located or the weather outside. My daughter handed me a tiny kitten which crawled up my long sleeve and lay on my right shoulder and cuddled up against my neck. It was too young to know how to purr yet. It was that small. I could feel its tiny claws on my skin as it crawled up my sleeve. My son Ken said he wanted a cutting board for Christmas so it must have been winter time but we had no decorations. We must have thought it was a great idea because three of us gave him one - nicely finished boards that were varnished and ready to use for cutting up or serving vegetables in his own room. He carried all his stuff to his room in a clothing hamper that had no lid on it. The three boards were at the top of whatever was in the hamper that I noticed was colored white wicker. Right after that, I was looking at my own face - not a reflection in a mirror - and looked at my right eye and eyebrow which had very little hair in the eyebrow and was wrinkled like I had lost a lot of weight. When I woke up I felt compelled to touch my right eyebrow to see if I did have hair on my eyebrow because I actually have not looked at myself in a mirror in a long time. In the dream, my eyesight at that point looked like it does in real life - not very clear with black spots in it as I have cataracts in both eyes. NOTE: I had cataract surgery in September of 2012 and now have 20-20 vision without glasses as I have brand new lenses in both eyes. It was like a miracle and I still haven't overcome the awesomeness of what it's like to have perfect vision. I've never had that privilege in my entire life as I started wearing glasses at the age of nine and who knows how bad they were before that was noticed that I couldn't see well. I also could still taste the lettuce when I woke up. I've had several dreams recently where I was eating food and woke up still tasting it. The lack of hair on the eyebrows and quick weight loss would signify radiation poisoning. Whether that is related to Fukishima nuclear plant radiation, or a new nuclear power plant blowing up, or even a nuclear bomb, only time will tell. #1 RULE FOR WINTER. MAKE SURE YOU ARE PREPARED FOR NO ELECTRICITY. WHICH ARE EXPECTED. EVEN THE GOVERNMENT IS REPARING FOR THAT EVENTUALITY. WORK ENDLESSLY WITHOUT FUEL EITHER. REFRIGERATOR - FREEZER. YOU CAN COOK OUTSIDE ON A GRILL IF YOU HAVE TO. Some people are saying we should prepare for at least 7 days, but the way things go after a hurricane, tornado, floods, loss of electricity and the fact that these disasters will continue and perhaps even get worse in coming years according to trends, one week is not enough. Some have said 7 years, but that seems too long so do what you can. Be sure to use the older stocked goods first and replace them with new. Otherwise you will end up with all old food you might not even want to eat. Always check canned tomatoes for spoilage, as even in the can they can spoil. Most other foods last a long time. 1. Water stored to last at least 7 days, at one gallon per day per person. (If you buy cases of l/2 litres - you can buy enough to last a couple of months) Recently, people are saying that water in plastic is toxic, so store water in glass if possible. up to 3 weeks, so to be really safe - plan for at least 3 weeks. 2. A good canteen and basins to catch rainwater. Also have a good supply of water purification tablets or bleach, or plan to boil your water. The surest way to purify water is to boil it for 15 to 20 minutes. You can skip foods you wouldn't want to eat in any case or if you have allergies. If you have a baby, include formula and baby food. If you have pets, you will want food for them as well. Store food needs in waterproof containers, capable of also protecting against insects and mice. Use Steel garbage cans or plastic 5 gallon buckets. The vacuum sealed method is also very good. If you are storing nuts or oatmeal, they smell and taste bad after a while, so they will need to be rotated. For all storing of food, the rule is: use up the old and replace with the new. Also, buy mice and rat traps and don't forget to use them. NOTE; I recommend freezing nuts for storage. 5. Medicines - Assemble a standard first aid kit, with a comprehensive first aid book. Also include things for headache, upset stomach, congestion, colds, such as Pepto Bismol, aspirin, Tylenol, Excedrin, disinfectants, prescription medicines; and anything else you use regularly. Include vitamins, apple cider vinegar, honey, garlic, sage tea for colds, mint tea, golden seal, brandy (good as medicine), herbal tinctures, hops, catnip (which helps you sleep), herbs for cooking, including dried garlic and onions, cayenne pepper, cumin, basil, and coriander and salt. After you've been eating rice and beans for a few days, they'll need lots of help to make them taste good. Add to this list things such as Colloid Silver, and perhaps even your own Colloid Silver maker. It isn't expensive to make your own Colloid Silver. Also don't forget sunscreen - nobody is safe in the sun long-term anymore. And always wear UV ray sunglasses outdoors even when the sun isn't shining as UV rays go through the clouds. Also learn about herbal medicines and if you have space, grow some of your own - most are perennials and once you get the plant growing, its yours for as long as you take care of it. See: http://www.earthmountainview.com for suggestions on herbs and growing your own food. 6. Toothbrushes, baking soda or salt to brush with, a good supply of dental floss (which can be used for other things as well) and another items you need for good tooth care. Stay away from toothpaste that has fluoride in it or you will kill your brain over time. 8. For a camp kitchen you need: camp stove with good supply of fuel (in wooded areas, all you need are rocks and a flat tin or grill), pots and pans, plates and bowls (unbreakable) (you can use Army surplus camp kits) cooking utensils, knife, forks, spoon, spatula, biodegradable dish soap, towels, bucket to carry water, dish pan, matches dipped in wax and stored in waterproof containers. 9. A good tent, sleeping bag for each person, extra blankets, sleeping pads, and ground cloth - and another waterproof tarp to cover your camp gear. 10. Clothing - Have clothing for all weather. Include a good warm coat and sweaters, hat for rain or shine, rain gear, a good pair of hiking boots that will take years to wear out, warm winter underwear, wool socks, summer socks (don't wear socks with holes in them as they cause blisters) (learn to darn socks) work gloves, hats, and whatever else you need for warmth and protection. 11. Hunting equipment. Hunting might be necessary for survival in some situations. Be prepared both with equipment and knowledge of how to use the equipment. First choice of a gun is a .22 caliber rifle. You can kill anything up to a deer with it. Purchase 500 rounds of .22 hollow point bullets. If you are not a good marksman, then get a 30-30 or 30-06 and at least 200 shells. A shotgun comes in handy for shooting things flying or running. The bow and arrow is still one of the best weapons. You will have to practice, and of course, you can never run out of shells. If you want to be unseen and unheard by unfriendly people, this would be a good idea. Also, take a compass with you. 12. Fishing equipment. - Get basic equipment. Include assorted sized hooks, fish lines, sinkers, etc. Fishing takes time, but if you are moving toward long-term survival, time is something you may have plenty of. 13. Wood stove. Get one with a secondary burn chamber. It uses less wood and creates less pollution. Get one with a flat top for cooking on. 14. Chain saw, extra gas and oil, spark plugs, chain, etc. 15. Bow saw and a tool to set the teeth with, extra blades. 19. Flashlights with extra batteries and bulbs; candles; propane, kerosene, or Coleman lantern with plenty of fuel, and extra wicks and mantles. 20. A good pocket knife and a sharpening stone. 21. Hammers, assorted nails, assorted screws, wrench set, pliers, wire cutters, screw drivers, pipe wrench, 200 feet of 1/4 inch nylon rope, duct tape. 24. Backpack - Waterproof. If you are forced to relocate, it may be all that goes with you. 26. Up-to-date maps of the area you want to live in. This will show you land and water away from human habitation. 27. A 4 wheel drive vehicle with all the proper tools for maintaining it. Extra parts. 28. Tire chains for snow. 29. Radio. Have more than one. electrical and battery operated. Get a crank operated one. (See C. Crane company for this information) You'll want to know what's going on in the outside world. 30. Soap for laundry and bathing. Also learn how to make your own and have those supplies handy. 32. A mirror. You'll want to see yourself, but you can use it for signaling as well. 35. Baby diapers. (Use cloth you can wash) Older kids can go bare bottom when necessary. Indians used moss and grass when necessary. 40. Pencils and paper, maybe even a notebook for a diary. In the survival sense, think warm clothing, think fleece. Those fleece throws (the single blankets) are great gifts, roll up nice and compact and are very useful as blankets, capes, padding for sleeping on the ground, tablecloths or even hung up on a lean-to to break the wind. By the time everyone adds their ideas to your list we will all need a U-haul on the back of that 4 wheel drive vehicle. Hey not a bad idea to learn how to build your own trailer, all you need is a spare axle, couple of wheels, a hitch and some wood. 44. Lots of good books to read. Notice that was in big letters so its important too. 45. .22 ammunition - amount stored should be 5000 rounds, not 500. It is small, inexpensive, and can be used as barter material if need be. 46. .30-30/.30-06 - other calibers to seriously consider are the .308, .270, .243, .223, and 7.62x39. Many people, myself included can't handle the recoil of a .30-06 (and I don't like .30-30). There are more rifles chambered in the calibers I mentioned than I can list, and all are good. It all depends on what you can afford. The amount of ammo one should store should be a minimum 1000 rounds, not 200. 47. A sturdy, fixed blade hunting knife should always be include. You can find these from Buck, Gerber, SOG, Camillus, Uncle Henry, and many others. I prefer the Camillus Pilot/Survival or Marine Combat knives. These have been made under contract for the US military for about four decades and have stood the test of time. They are also inexpensive ($25 and $35 respectively) so if one is lost or happens to break, you don't get as upset as you would should your Gerber BMF ($240) bite the dust. 48. Many people, myself included, have not been able to master the use of a sharpening stone. But with the use of a sharpening kit, such as those by Lansky, we can bring up a very sharp edge on our knives. Great for use on kitchen cutlery as well. 50. 200' to 500' of 550# test Paracord is a great addition to your supplies, especially when the 1/4" nylon cord/rope is too thick or not the right tool for the job. 51. Boiling water may be effective, but it is not the best way to purify water. Boiling removes the oxygen content and causes it to be flat. For EMERGENCY purposes only one can use un-scented household bleach to purify water, but you should use only 1/2 teaspoon per 5 gallons of water (1 tsp should the water be cloudy). The best method is to use HTH dry chlorine (65%), which can be purchased in bulk at stores like WalMart, Target, KMart, etc. (Also a great barter item.) The amount to use is 1/4 teaspoon (0.03 ounce) per 300 gallons for a 0.5 ppm of chlorine. 52. One can also get a complete cookset...cookpots, frying pan, coffee pot, plates, and cups...of good or better quality in the outdoor department of WalMart, Kmart, Target, etc., or a good outdoor supply store that sells camping equipment. 53. One should have two or three pairs of good hiking boots (U.S. issue combat boots are still the best and only cost $60-$80 mail order) in their closet and one dozen pair bootlaces per pair of boots (laces also come in handy for short term temporary uses, too). Should the long-term effect be much longer than anticipated, then the extra boots will be needed. Also a couple pair of good cross-trainers or running shoes would be advisable. 54.You should always have a handful of disposable lighters in addition to matches. They come in quite handy and you don't have to be a smoker to keep them on hand. They are inexpensive and take up very little room. 55. When we packed our food we used food-grade diatomaceous earth for the grains. All grain already has the eggs of insects in it - it's just the natural way. When they hatch out the diatomaceous earth either smothers them because the particles are so tiny or if the larvae is bigger or soft-skinned it dries them up. I bake my own bread and grind my own flour. In some of the jars where we didn't use diatomaceous there is an occasional weevil and I grind it up - if folks eat animals then a bug or two shouldn't be a problem. Diatomaceous earth is full of minerals and is a safe, non-toxic way to treat your food. You don't want to breathe it because the particles are so tiny but then, you don't want to inhale flour, either. It's real cheap, too. We use 1/4 cup for a 5-gallon bucket of grain. We half-fill the bucket, sprinkle 1/2 the dust on, put the lid on, roll the bucket all around, take the lid off, fill the bucket with more grain to the top, add the rest of the dust, roll it around and you're done. You can do it in smaller batches, too. In gallon jars and then pour it into the bucket. An added step would be to re-open and add a small piece of dry ice to the top. (I like to put it on a piece of broken pottery to keep it from "burning" the grain.) Let the lid rest on top while the dry ice sublimates into gaseous carbon dioxide and displaces bug-breathable air. Then seal tightly. ALSO: ..I suggest sealing your bags, boxes etc. to keep from getting damp, then freezing them for 3 days..it kills the eggs. I have done this with everything I buy..it works. I have used rice, flour, etc. that is months old (re-stocking as I use). I'm sure it will work for animal feed as well. Another good storage trick for grains and legumes is to use oxygen absorber packs that can be purchased wherever food storage supplies are sold. No oxygen = no living things, and no oxidation of the contents or the container. To avoid 6 legged critters, vacuum seal your food (see Tilia Foodsaver) and store in 5 gallon plastic buckets with the snap on lids. Or, store food directly in the 5 gallon buckets and pay to have the buckets nitrogen injected. Costs a couple of bucks a bucket. Either of these methods will kill existing critters and prevent future contamination. Second to vacuum sealing, you can use zip-lock bags. Fill the bag, lower it into a sink full of water until the water is just to the zip- lock. Seal the bag. Remove and dry the bag off. The water pressure pushes a lot of the extraneous gases (air) out of the bag. Rats can, but won't gnaw into the 5 gallon buckets unless they have a reason to, like the odor of something yummy on the other side. Properly sealed, a 5 gallon buckets should be odorless. Rats require 3 things to survive, food, water and shelter. Remove any one of these three things and the rat population disappears. I have used boric acid effectively for years to keep away roaches, along with Roach Prufe. The last place I was in had ants before I brought in food. One place I had and didn't prepare very many meals, had neither roaches nor ants, but I brought in weevils from the store, and they ate everything resembling a carbohydrate. 56. MAKING DO: . Stock up on kids clothing from the 2nd hand stores, jeans, sweats, warm winter clothing, and if you can't get to a store for any reason, you should have plain white/beige muslin cloth to make longs skirts & shirts once your regular clothing is gone.....but then we will also need to learn how to make clothing out of sheep's wool and grasses. You can make strong sandals out of tires so keep a few around and learning to work leather is a good idea too. There are great leather catalogs you can send for and check them out. Get a couple of old bikes too. Also get extra tubes & stuff to fix them with. Also pick up a few "fake" furs at the used clothing stores to use for covering. Or get real fur, but probably will cost more. You can get wool blankets at the Am Vets & Goodwill stores. Here's a great idea for your meat chickens. You might want to consider feeding your chickens nothing but sprouted wheat if you don't free-range your birds. However, free-ranged chickens and their eggs are healthier to eat. Buy wheat and soak it in a bucket of water overnight. Drain off the water (give it to the chickens) and let the bucket sit for 3 or 4 days. Rinse the wheat twice a day. Once the little root pokes out it can be fed to the chickens and will have so much more vibrational energy (or spark of life) and nutrition than the unsprouted wheat kernel had. Chickens fed only on unsprouted wheat will dress out to about 8 to 9 pounds each--this sounds incredible but it's really true. If you are going to raise chickens for meat it would be interesting to try this method. Chickens fed the regular way average 5 to 6 pounds on average. The sad truth is that store-bought chicken is mushy and tasteless and of course, you get all the hormones and chemicals the chicken ate. When you taste your first home-raised chicken meat you will be in awe. Chickens raised on the sprouted wheat taste even better. These days, anything you can get that is organic is healthier than anything you buy in a grocery store. Buying at local farm markets is preferable. Always ask if the food is organic before buying. Even if you don't eat your chickens this idea can be considered for the "after time" when perhaps you might be scrambling for something nutritious to feed your birds. 58. MONEY? What good will money be? Greenback are usually the first thing to become worthless in a sinking society. Gold, silver and gems are what are needed after the governments all collapse. Salt is scarce in wet climates away from the ocean. The only natural source in such places is mineral springs. Vegetarian animals need salt and animals like deer and elk and mountain goats will go to a lot of trouble to get it. Porcupines need even more sodium than most in order to survive all the excess potassium they get from eating pine bark. Thus, to find salt in the wilderness, find out where the animals get it. I once found what seemed to be too many deer trails in a certain area of forest, and after exploring a bit found that they all converged on a mineral spring. This particular spring was not shown on any geological survey map and was pretty much trampled into a mud-wallow by the deer and elk, but in a pinch a person could dig it out and get salty water. Note it is also a good place to get deer and elk, and maybe Indian arrow-heads. Of course some mineral springs have poisonous amounts of minerals like arsenic in them too, so you're taking a bit of a gamble with any non-tested mineral water. 60. SPROUTS - Don't overlook sprouting as a great source of food in time to come. For families with financial constraints buying even very large amounts of seeds to sprout is affordable. You can live entirely on sprouts. The seeds stay viable for many years and are packed with nutrition and living, vibrating energy for your body. This is a "living" food vs. a dead food. If you have little storage space and few dollars you may want to learn more about sprouting. Practice now, making and using sprouts. You can do it simply: for alfalfa sprouts (the most common) just use a tablespoon of seeds, soak them in some water in a jar over night. The next day pour off the water. The health food stores have a 3- piece lid kit to screw onto any wide-mouth canning jar. After you pour off the water invert the jar on an angle upside down (I use a little dish to set it in). Rinse those same sprouts twice a day, morning and night. They don't need the sun to sprout. After 2 or 3 days they will have all sprouted and you can set the jar in a sunny window if you wish to "green" them up for use in salads or eat out of hand. We always drink the rinse water because it's packed with vitamins and minerals. Or use this water to water your plants. Or for your pet's water. Walton's has a sprout variety pack that's already vacuum packed and has lots of different kinds of sprout seeds. We bought ours back in 1997 and they are still sprouting great. Some of the bigger seeds will make really big, long sprouts. They taste the best when eaten young, though. Older sprouts tend to taste somewhat bitter. A sprout can actually be eaten anytime the tiny little root appears. We usually wait a few days, though. It will be fun to learn about sprouts and a great comfort again, if folks want very much to prepare but don't have a lot of money. 61. CONTAINERS - You can get 5 gal. sturdy plastic containers at the bakery shops as well as smaller sizes. Fill EACH one with things such as Medical supplies, clothing, food, ammo, survival books, reading books, Classic books, tools, etc....and don't forget all the family pictures. There is a process where you can put a picture on a piece of metal & it will last for hundreds of years. Regarding water: chlorine treatments do not kill Cryptosporidium oocysts. the best way to rid water of these is boiling. Some say 5 minutes, but bringing water to a rolling boil should be enough to kill any organisms in it. Better to live on water with "less oxygen" (which can be re-added by shaking a half-full jug of water for a few minutes) than suffer the effects of an infection. Also, if you have squirrels, rabbits, chipmunks, or other small, rat sized mammals, a few rat traps could prove invaluable. They are more effective that a dead fall trap, and much lighter (and squirrel with barbecue sauce is dang tasty). Peanut butter is the perfect bait. Also, a high power pellet gun is fairly silent, and will be effective on creatures up to small dogs (when you get hungry they start looking tasty) also works as a deterrent for larger dogs (expect packs of wild dogs in really bad times). Ammo is cheaper even than .22 rounds. Find out about tularemia and bubonic plague (still exists in many parts of North America, especially on small rodents) and how to protect yourself from them. Remember the best way to extract maximum calories from meat, and ensure that it is safe to eat is to boil the heck out of it, split the bones and boil them too, eat the marrow, brains, heart and liver (kidneys are your option: not worth the trouble on smaller animals). As such, expect soup to be your best friend when times are tough. A few cheap plastic tarps can be invaluable They can serve as makeshift tents, floors, ponchos, camouflage (if they are the right color; can be achieved with spray paint), rain catchers, etc. etc. etc. ad infinitum, ad nauseum, ad absurditum. First aid: expect medical services to be limited in very bad times. learn the basics of first aid, long term wound care, and as much general medicine as possible now. An extensive first aid kit (see the STOMP portable hospital at www.cheaperthandirt.com as an example) including many bandages (sturdy cloth is best, they can be boiled and reused if necessary) and perhaps some powdered antibiotics, such as tetracycline and erythromycin (in an emergency fish or livestock antibiotics could be used, learn the indications, contraindications and dosages well or you might kill yourself dosages for humans are the equivalent for pigs). Lastly, remember that if you are planning on traveling somewhere, others will either be there already, or also traveling there (expect mass migrations in rough times). figure out ahead of time how you would like to interact with them (and expect tensions to be high when resources are scarce). Even more lastly, as the hitchhiker's guide to the galaxy says: "don't panic." Keep your wits about you and think creatively, and you will survive. 9 volt batteries kept in individual waterproof bags, a dozen at least. Accompanied by (not stored together) steel wool will light fires on the wettest of days. Also a few Sterno petroleum jelly fuel cans are great for fire starting, not the whole can at once but just a 1/2 tsp will light a good fire in wind and rain. Also safety gear, such as shin, knee, elbow pads and a good rafting/skateboard/bike helmet is great for doing anything dangerous or rugged (forest gathering, hunting, exploring) safety glasses are cheap $3- or less per pair. And save your most precious of senses. Life jackets are good knee savers when working/planting near the ground. Good for makeshift Pillows and seat cushions. Bottle caps (metal) are great tools and have 100s of useful uses from fishing lures to de-scaling fish, cleaning, digging, place in chicken areas like lots of little bowls and will collect rain/dew for birds. Think bowl shaped bobby pins. I save anything that resembles a tool or simple machine. Also old electrical appliance cords, great copper in side, makes great binding rope. Conducting agent, individual wire can be used for sewing/emergency suture. A COMPLETE SEWING KIT WITH MANY TYPES OF NEEDLES, THREAD AND WIRE YOU CAN SEW WITH. FROM THE DREAM OF AUGUST 13TH, APPARENTLY SOME PEOPLE WILL WANT TO BE UNDERGROUND IF POSSIBLE. ALL FOOD WILLL HAVE TO BE GROWN UNDER COVER - LIKE IN A GREENHOUSE AND ANIMALS WILL HAVE TO BE SHELTERED THAT WAY ALSO. 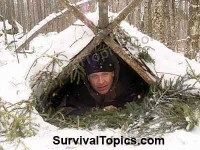 This guide from SurvivalTopics.com will show you how to quickly build an emergency survival shelter for cold weather survival. Using this method you can survive extreme cold conditions - even if you have a minimum of warm clothing and supplies. We will start with a completed shelter and peel back the layers to expose just how the shelter was constructed using materials at hand. Survival in winter is a whole different game than during the warmer months. February in these northern mountains is typically the coldest month of the year. Temperatures routinely go down to minus 20 F, sometimes much lower. When combined with winds that can be gale force, the situation can turn deadly fast. That is, if you are unprepared to meet the outdoor survival challenges of this beautiful mountainous landscape. Many people have died in cold weather conditions when just a little knowledge on how to build a simple winter survival shelter would have saved them. Unexpected things can happen – lost hunters, downed aircraft, hikers caught out at night when they underestimated the time it takes to get from point a to point b. Perhaps someone has been injured and you are faced with going for help, leaving them alone in subfreezing weather with little chance of survival in the open. Having underground survival shelters might seem to be a bit of an uncanny thing to have. However, back in the days of the 1950’s, during the continual possible threat of nuclear war between the Soviet Union and the United States, having one was not too bad of an idea. This was for a variety of reasons. The primary one was to help protect your family from any collapsed parts of your home and fallout in case of a nuclear explosion. Here is some info on some underground fallout shelters, and where you might be able to find them today, and how you could possibly plan one. Would You Find Underground Fallout Shelters? Some underground survival shelters you might come across today are as simple as concealed basements to a home, or in some more elaborate cases, a system of channel survival shelters. In this case, a family might have developed a way to link with another neighboring family to do have some sort of shelter during an emergency or other form of disaster. They are set up to help keep operations going underground in case the above ground portion was destroyed. In some cases, there have been underground survival shelters bombs that our country has created. These are also known as bunker bombs. How Should You Make Underground Survival Shelter Plans? In this day and age, it is a little unrealistic to have underground survival shelter plans. However, there are some that have built this type of a structure just in case the worst disasters happen. In this case, if you wanted to jump on that band wagon, you could check with your local county government office for any underground plumbing, electrical objects, and other objects that could get in your way. The next thing in making underground survival shelter plans would be to come up with a basic design plan for a supportive structure that would have emergency or long term supplies for you and your family. You might want to invest in certain steel structures that would protect you from any damaging material. You might also want to find a way to have clean water stored there as well as a form of electricity. In case there is some type of emergency or disaster such as a tornado, these shelters are great for going to until the tornado has passed. Tornadoes pick up everything in its tracks, so being inside a home or on high ground would not make a difference. You can pack a small kit of things to help you ride out the storm and proceed with others to these shelters for a while. Overall is an underground survival shelter really needed these days? Not really. If you would like to build an underground shelter from inclement weather such as tornadoes or other damaging forms of weather, then that might be the more sensible reason to want to move forward with any underground survival shelter plans you might have. Live Life On The Safe Side! Decades ago, the Federal Government cut off funding for the maintenance of fallout shelters. Because of decreased threat of international nuclear war occurring, it was determined that fallout shelters were no longer needed. With advanced detection systems and information gathering capacity, government officials believe that there will be adequate time for the public to be warned and to seek shelter. In 1993, the Federal Government policy was to no longer stock fallout shelters with supplies, or to maintain shelters. The Federal Emergency Management Agency in cooperation with the American Red Cross and local government leaders in each community work together to identify buildings that are suitable to serve as community shelters. Buildings are inspected after any natural or man-made disaster to ensure that they have no structural damage. They are also evaluated on how many people can be accommodated with food preparation areas, restrooms, showers, and sleeping space. Once suitable buildings have been identified, radio and television broadcasts over the emergency broadcast system go out, identifying buildings in the community that have been cleared to serve as emergency shelters. Often, schools are selected because of their large size, number of restrooms, food preparation areas, and football fields, where tent cities can be constructed. Newer buildings that have up to date building codes are usually selected. The Red Cross maintains a list of good buildings that might serve as an emergency shelter. After a disaster, the emergency management agency inspects each of these before the public can be directed there for safe shelter. For this reason, the public may be told to use one building after one disaster, and be sent to another building another time. Do not automatically go to a shelter expecting help. After disasters, debris covered streets, downed power lines, unsafe bridges and overpasses, and collapsed buildings make the process of inspecting buildings for structural soundness very slow. This process takes several days to complete. For this reason, every family should prepare for disasters and emergency crisis and be able to be self-sustaining for at least 72 hours. Australia, Canada, Denmark, Germany and US Federal, State, Local Scanner LAWS! Energy Efficient Homes: Buildings, Domes, Shelters, Yurts. - A website devoted to helping people prepare for an uncertain tomorrow. Louisiana Tech Faculty: Sterling, Raymond L.
A builder of earthsheltered homes, fallout, blast, and storm shelters. - A great site with EXCELLENT information on being, and staying, an "Urban Dweller"
- food storage, hydroponics, education, energy, and lots more. land navigation and other related topics. SFTS - Weather Safety and Storm Shelters! - From Northern Ireland - A general resource for the preparedness minded, offering access to original files and some gleaned from other sources. A very nice site...includes a chat room, many files, and a neat local flavor of its homeland. A Site about Survivalism, Self Reliance, and Firearms. Fallout Shelters Were Mothballed At The End Of The Cold War. Should They Be Reopened? Fallout shelters were administered by the U.S. Federal Civil Defense Administration, which operated from 1951 in various forms until 1979, when its functions were pulled into the Federal Emergency Management Agency. When we were moving out of the Cold War and moving into an all-hazards environment—‘all-hazards’ meaning, earthquake, severe storms, severe weather, flooding, volcanic fallout, hazardous material spills, things of that nature—rather than strictly focus on war, we made a concerted effort to remove all the food, all the ventilation kits and the sanitation kits to about the 90 percent level. We destroyed the food because it was sour and unusable. It’s extremely important that everybody prepare themselves for any event. The world’s not going to come to an end. We must plan to survive and live with the consequences of what is coming. Most of the fallout shelters are gone. Getting rid of them was a big mistake. The world is too uncertain a place for us to throw away our contingencies. "Most of my life I was afraid that the world would blow up," says Marshall Berman, professor of political theory and urbanism at the City University of New York, author of the book "All That Is Solid Melts into Air" and longtime resident of the city. "The fallout shelters make me remember that fear." The shelters first appeared in 1951 after passage of the Defense Emergency Act, and were symbolic of the attitudes and culture of the time. They were part of an emergency response plan in case New York was the target of Soviet nuclear fire. "The shelters were placed in large sturdy buildings, usually with a basement," explains Chris Griffith, head of the Atomic Archive, an educational CD-Rom and Web site on the history of the atomic bomb. "Almost all government buildings were designated as shelters, libraries, schools, etc.," Griffith says. "The only characteristic of these places was their ability to house some number of people, but I do not think any public buildings were upgraded to withstand the effects of the nuclear blast." The act defined a shelter as "a building, structure or other real property, or an area or portion thereof, so constructed, altered or improved as to provide protection against harmful radiation resulting from radioactive fallout." (a)Ten square feet of shelter floor area per person shall be provided. (b)At least 65 cubic feet of space per person shall be provided. three cubic feet of fresh air per minute per person are required. be designed to prevent an effective temperature exceeding 85 Fahrenheit. fresh air supply rather than through air cooling and humidity control equipment. They may be to busy helping themselves. The basic conditions some expect to occur in a fallout shelter are as follows: Shelter stay may be required for several weeks to protect the population from radioactive fallout. Outside support may either be overwhelmed with other problems or terminated and thus unavailable. Shelter populations may be quite large; severe crowding may exist with each occupant permitted as little as 10 square feet of livable space. Vital provisions such as food, water, and medicine may be scarce and ventilation may be poor. Shelter populations evacuated from high density disaster areas may be a diverse and heterogenous mixture of ethnic and socioeconomic groups. Some occupants may have injuries resulting from direct weapons effects. Family members may be separated from each other. Extreme physical, behavioral, and health problems may quickly develop among the sheltered populations because of the above conditions. Management problems to be expected are criminal behavior, sexual behavior, use of alcohol and drugs, fighting, gambling, hoarding and inappropriate use of supplies, smoking, unwillingness to obey rules, dangerous personal belongings and rebellion. Respiratory infections are the most common and troublesome of human infectious diseases. Usually mild, they may become serious under shelter conditions and will spread rapidly throughout the shelter population. The most likely respiration infections will include the common cold, meningitis, streptococcal infections, influenza and staphylococcal infections. In some cases, pneumonia outbreaks will occur. A small survival kit (72 hour kit) should be placed in the trunk of every car. Supplies should also be stored at our workplaces. If early warning is taken from a loss of electrical power (see EMP in `Nuclear Defense Issues') we could have as much as 25 minutes warning of a possible event. Radiation decays very quickly. Ninety percent of the gamma radiation is gone after the first 7 hours. Ninety percent of the remaining 10 percent is gone after two days. In most areas, after two days, we could leave our expedient shelter and go quickly to our homes. However, if possible, we should stay sheltered for two full weeks. After two weeks there is only one, one thousandth of the gamma radiation remaining. A home basement is not adequate protection in itself, even in areas of light fallout. However, shelter could be taken in the basement under a strong table. Two feet of books or other heavy objects should be placed on and around the table. A hose could be brought in from the water heater for drinking water, and a 5 gallon bucket with plastic bags could be used for sanitation. These options, however, must be well thought out before hand. Tunnels -- Many public buildings have tunnel access. Underpasses--There is good blast protection (10 psi) high up under over passes, however there is no radiation protection. The more distance between you and the source of radiation, including fallout particles, the less radiation you will be exposed to. Heavy, dense material between you and the radiation such as concrete, brick, or being underground, provides much protection from penetrating gamma rays if the layer is thick enough. The best protection exists in buildings of heavy construction or in underground structures, such as basements. Of course it is not possible to predict targets of nuclear bombing. However, large metropolitan areas and centers of military, industry, or economic importance to our nation are generally considered as having higher potential for attack than rural or smaller towns. A fallout shelter can be any building with roof and walls thick and dense enough to absorb the strong gamma rays given off by the radioactive fallout. Most radiation emergency situations require that you remain in the shelter from three days up to two weeks. To improvise a shelter, set up a large table or workbench in the corner of your basement or a room that is below ground level. On top of the table, pile as much shielding material as the table can safely support without collapsing. Also place as much shielding material as possible around the table. Once family members are safely inside, or under, block the opening with more shielding material. Many common supplies can be used as shielding material. House doors that have been removed from hinges, especially heavy outer doors, dressers or chests can be placed up against a table or workbench. Drawers, trunks, boxes, or cartons can be filled with dirt or sand. Tables, bookcases, books, magazines, firewood, and lumber can all be stacked to provide some additional protection. If these shelter materials are not available, furniture or large appliances can be placed against a wall. Stack other shielding material around the large appliances and furniture. If you must evacuate because of radiation hazards, take your 72 hour emergency kit with you. If you must stay in a shelter, you may have to remain there up to two weeks. Water is often the most overlooked part of 72 hour kits. Take with you as much water as you can and plenty of food. Darksky -See where civilization is (and isn't) by the amount of lite cities give off at nite! NASA and Astronomy related stuff.. US Army Chemical and Biological Defense Command. NEIC - Last 21 quakes REAL TIME DATA! Volcano World - Much info, Volcano Cams, etc.